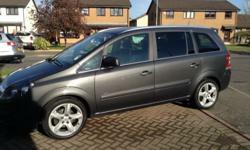 Vauxhall Zafira - Very good example with automatic gearbox and low miles , 2 owners, , 1 keys & tow bar. Part service history, last service 1 year ago on 48k, the price includes oil service. 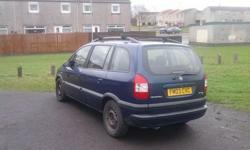 rear trailing bushes just have been replaced, 4 new tyres past year fitted. 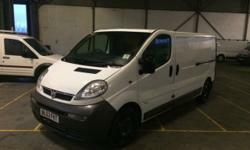 Long mot till 29/01/2018, 1st reg. in November 2008. Air Conditioning, Electrically Operated Front Windows with Safety Autoreverse and One-Touch Facility, 16'' Wheels (205/55 R16), CD 30 - Stereo Radio/CD Player, a lot of airbags, adjustable steering wheel column, ESP, no spare wheel, but foam repair kit is included. despite on cat D (front bumper, wing and headlight have been replaced after light accident) it drives very well, no noises or knocking, no any lights on the dashboard and 150hp more than enough for this engine, which gives up to 50mpg on motorway and only 53.5k miles on the clock. excellent family car. no time wasters please, silly offers will be ignored. any questions please contact me via text, call, email. 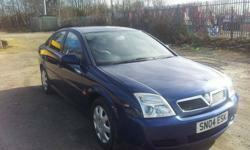 Vauxhall Vectra Life , Price lowered to clear, very good condition, full service history.